If you love food and love local cuisine, what better way to kick off Valentine’s Week than enjoying food from 15 local chefs at this year’s Taste of Ormond? Let Ormond Beach’s thriving restaurant scene take you on a taste adventure sure to please your palate and titillate your tummy. On February 8, 2015, local restaurants including 31 Supper Club, Cakery Creation, Daytona Pigstand, Florida Hospital Catering, Fusion 43, Grind Gastropub, Hull’s Seafood, Kale Café, La’s Bistro, Larry’s Giant Subs, Lulu’s Oceanside Grill, Maria Bonita, Mia Dona, Thai Woodhouse and Theia’s Pastries will offer small plates with tasty samples of their cuisine, while S.R. Perrott will provide a wine bar and a craft beer tasting. This popular event sold out last year as foodies gathered to taste, sip and enjoy in a casual, garden atmosphere. The event begins at 4 pm under a large tent in Rockefeller Gardens at The Casements, 25 Riverside Drive. Guests will be able to eat their fill and taste 6 wines and 20 beers – all included in the ticket price of $50 per person. Sponsor tables can seat up to 10 people and are available for $500. 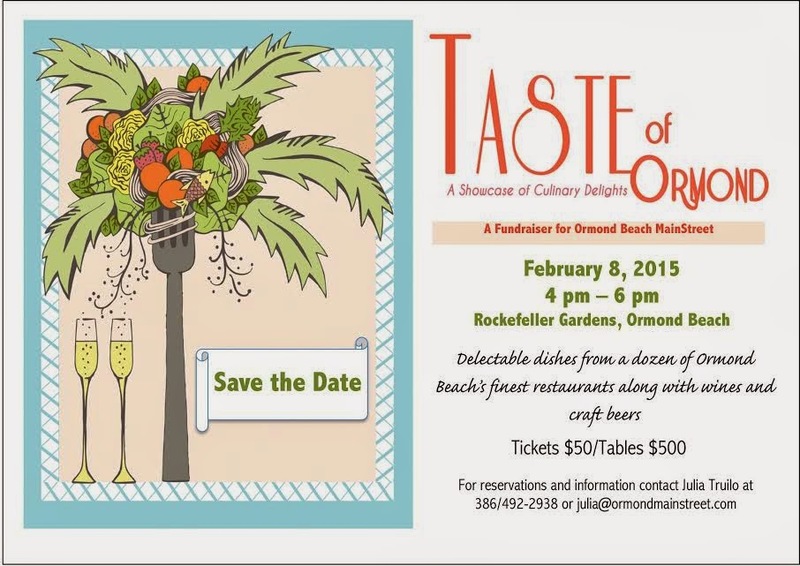 Tickets for Taste of Ormond are available online at Eventbrite.com (www.TasteOfOrmond2015.eventbrite.com) or by contacting Ormond MainStreet at 386/492-2938.